A poster created for the “Families Belong Together” rally Saturday. Participants listen to guest speakers during the “Families Belong Together” rally Saturday at Buckley Park. 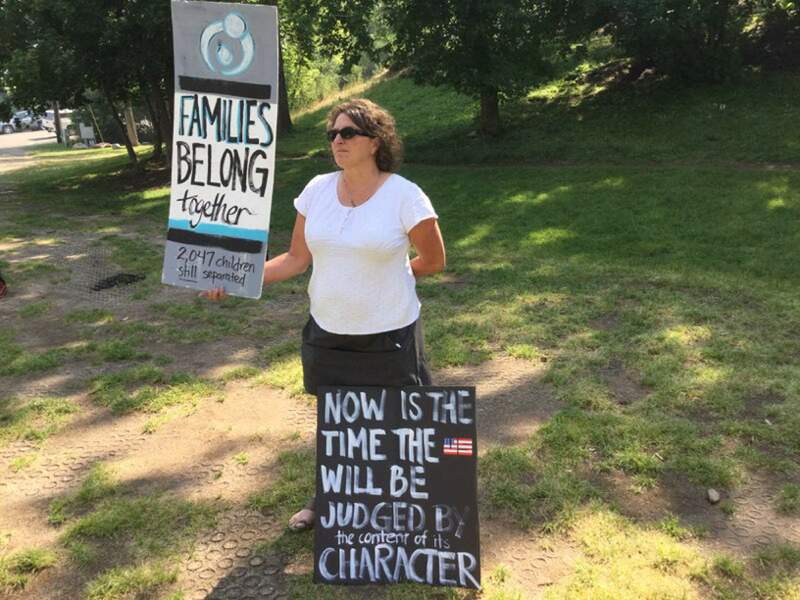 A sign held up during the “Families Belong Together” rally Saturday. 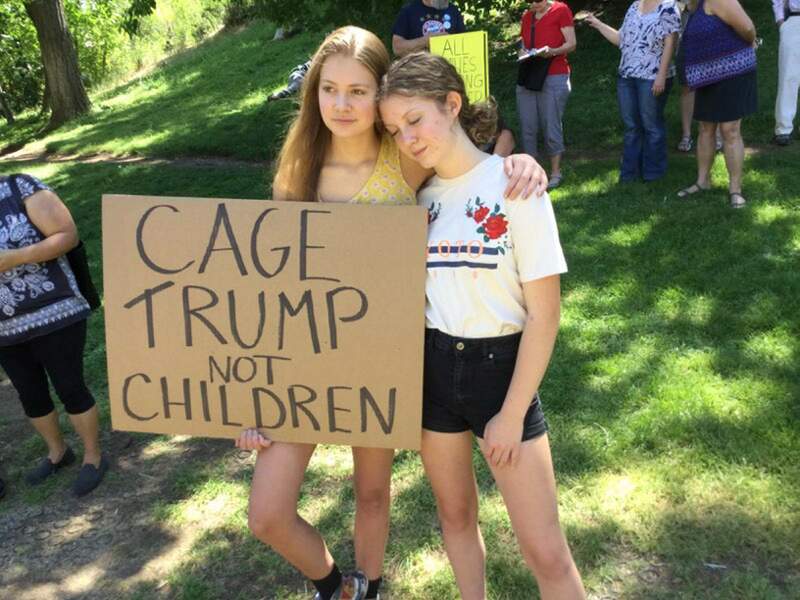 Sophie Schiavone, left, and Lily Smith, right, hold a sign during the “Families Belong Together” rally at Buckley Park. 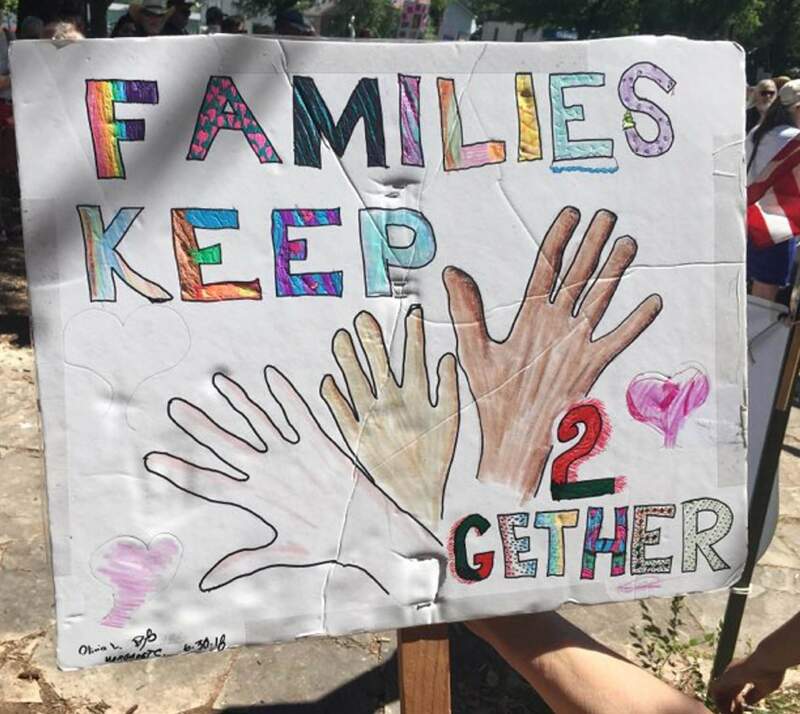 About 350 people turned out for the “Families Belong Together” rally Saturday at Buckley Park. 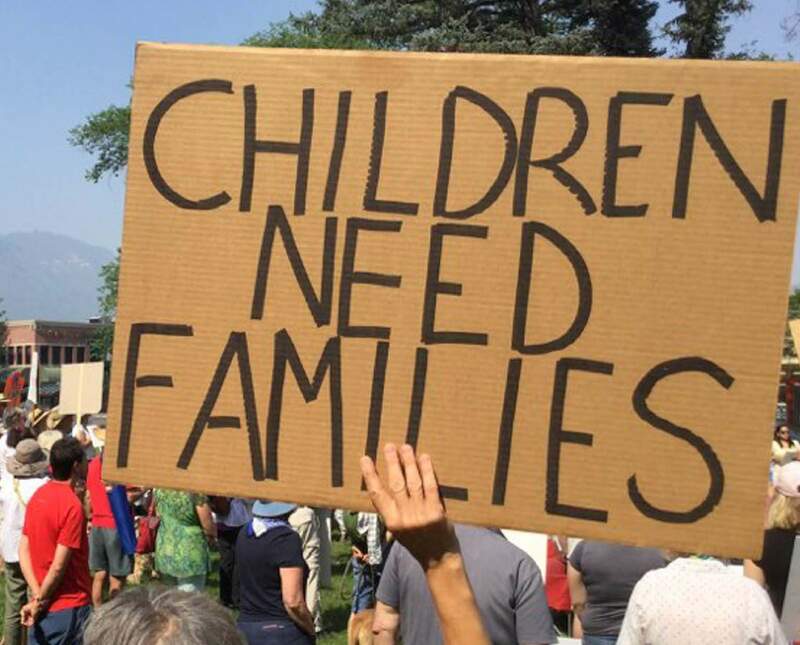 The White House’s zero tolerance immigration policy was the catalyst for “Families Belong Together” protests across the country Saturday, including in Durango. Guest speakers gave fiery speeches that claimed the policy was cruel, inhumane and racist and condemned politicians who supported it. Many people waved posters that criticized the policy and a few people wore masks that covered their face in support of illegal immigrants who would not want their picture taken. In addition to speakers, the event featured group activities, live demonstrations and tables for people to volunteer. Part of the activities included the crowd singing “This Land Is Your Land” and an opportunity to use an open mic to address the crowd. 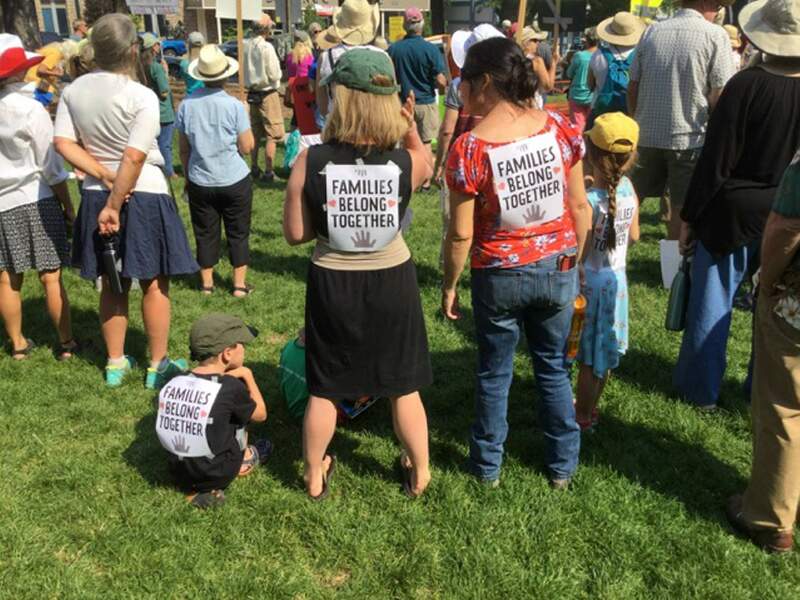 The “Families Belong Together” rally in Durango was one of 600 organized events that took place across the country in defiance of the current immigration policy, which has prompted the separation and detentions of migrant families. Speakers addressing the crowd encouraged people to not only protest the policies but to vote in November. De Pablo legally entered the United States from Mexico in 1993. 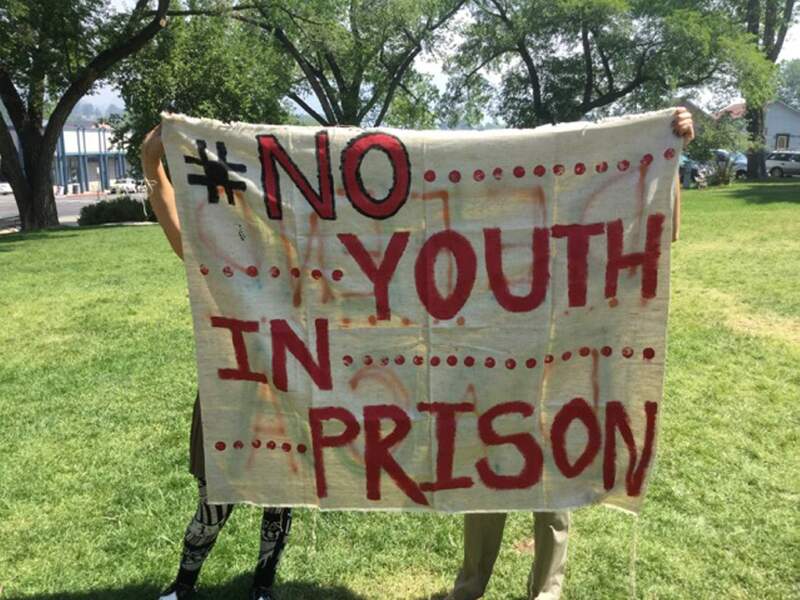 She was one of the original organizers of Compañeros: Four Corners Immigrant Resource Center and has seen firsthand the struggles many illegal immigrants have experienced. De Pablo said several members of the immigrant community told her they were fearful to attend the rally, regardless of whether they were legal citizens or not. State House Rep. Barbara McLachlan spoke, encouraging the crowd to vote and to make calls to Sen. Cory Gardner and Rep. Scott Tipton to encourage them to oppose the policy. McLachlan said she was pleased with the turnout and hoped to be a voice for minorities. An undocumented man who has been living in Durango for over a decade attended the rally. He had second thoughts about coming, but thought it was important for the community to see him protesting the policy that could potentially harm his family. The man, who asked not to be named, is concerned the federal policies could separate him from his children, who he has tried to hide the news from. He said on a scale of 1 to 10 on how frightened he is, he is at an 8.